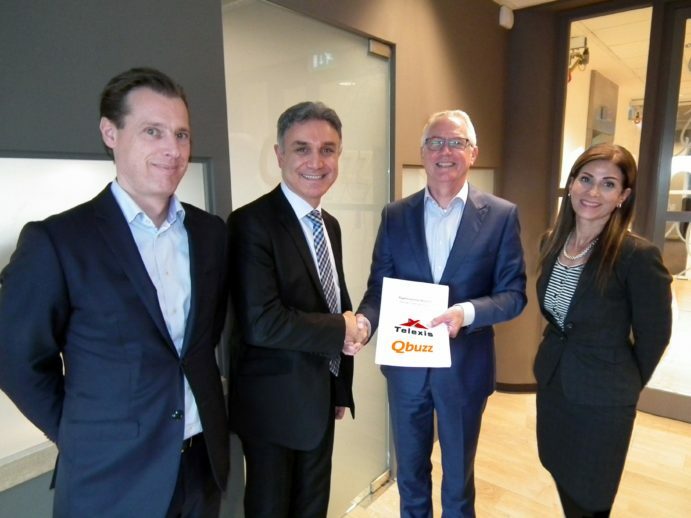 Telexis, an innovative and hardware independent provider of e-ticketing solutions with certified products for the OV-Chipkaart infrastructure in the Dutch national transit vertical, today announces that Qbuzz, one of the major Dutch transit operators, awarded it with a number of contracts to realize its new Automated Fare Collection infrastructure. To this end, Telexis will provide its innovative, proven and future proof solutions to Qbuzz. From left to right: Gerrit Spijksma (CFO, Qbuzz), Toofan Otaredian (CEO, Telexis), Jan Kouwenhoven (CEO, Qbuzz), Bita Zamanian (CFO, Telexis).